Jedediah Smith was a hunter, trapper, fur trader, trailblazer, author, cartographer, and explorer of the Rocky Mountains. 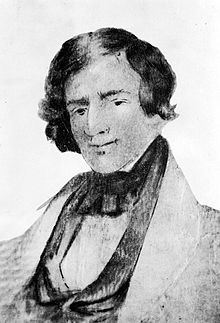 James Beckworth was a mountain man. 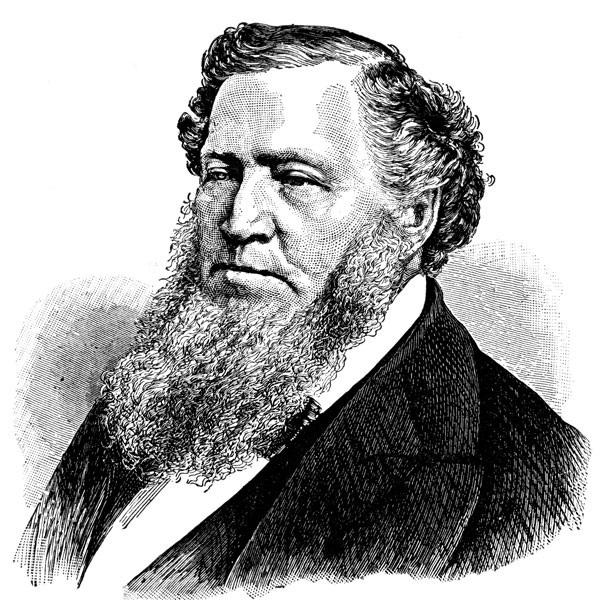 Brigham Young was an American leader and a settler of the Western United States. 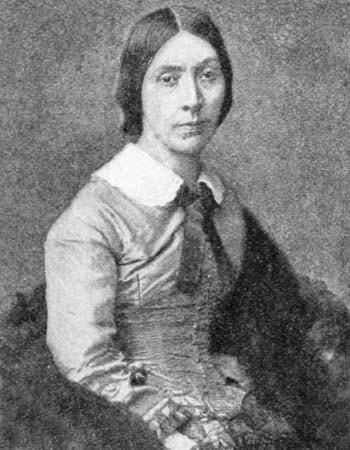 Jessie Ann Benton was an American writer political activist. The Oregon Trail was a 2,000 mile wheeled wagon route and trail that connected the Missouri River to valleys in Oregon. 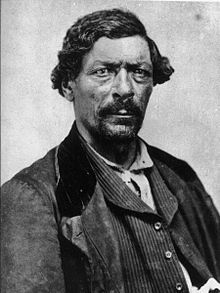 The beginnings of the Oregon Trail were laid by fur trappers and traders and were only passable on foot or horseback. When the first migrant wagon train was organized, a wagon trail was cleared. This made the trips faster and safer almost every year. 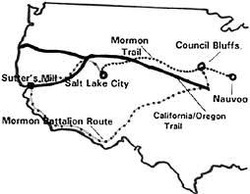 The Mormon Trail is the 1,300 mile route that members of The Church of Jesus Christ of Latter day Saints traveled from in the years of 1846 to 1868. Today the Mormon Trail is a part of the United States national trails systems, as the Mormon Pioneer National Historic Trail. The Mormon Trail extends form Nauvoo, Illinois to Salt Lake City, Utah. The Santa Fe Trail was a 19th-century transportation route that connected Franklin, Missouri with Santa Fe, New Mexico. At first, it was an international trade route between the United States and Mexico. It also served as the 1846 U.S. invasion route of New Mexico during the Mexican-American war. 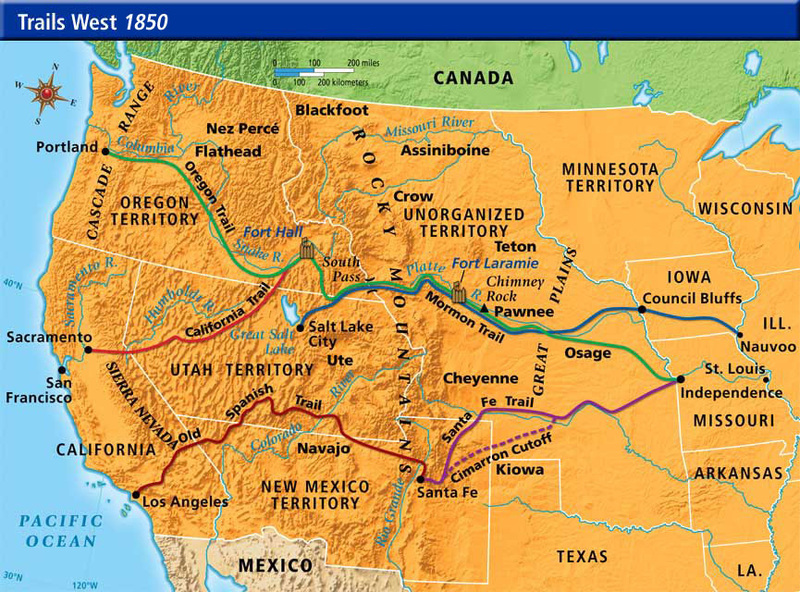 After the U.S. acquisition of the Southwest, the trail helped open the region to U.S. economic development and settlement, playing a big role in the expansion of the U.S. into the lands it had acquired. 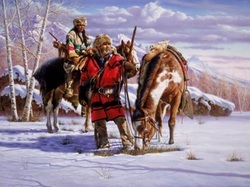 Mountain men are trappers and explorers who live in the wilderness. They were most common in the Northern American Rocky Mountains from about 1810 through the 1880s. The life of mountain men were hard and tough. Living in the wild always had them in constant danger form starvation, dehydration, freezing cold, burning heat, wild animals, and Indians. By the year 1869 when the first transcontinental railroad was finished, over 350,000 pioneers had taken the Oregon trial to start a new life. Many of these were women and most were accompanied by children. Before heading west, many women often spent their day doing nothing more than visiting, needlework, and gardening flowers. 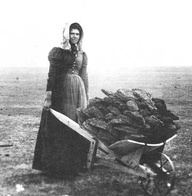 Women had many children to help with chores on the trail. Most of the children, especially the girls, were illiterate. It wasn't until the middle 1800's that school became an option for the children. This is a map of trails in the west in the year 1850. 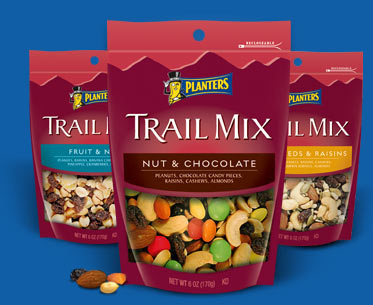 Take Trail Mix on the go! The snack that never goes bad but is always healthy and delicious! It will surely give you a lot of energy!! !